Not all salads have to incorporate lettuce or greens. In fact, some of my favorite salads don't even include them. This salad is one I especially like because it's easy to put together using fresh herbs, lemon juice, and olive oil. The dressing keeps well and I prefer making it in advance for flavors can meld a bit. For a heartier salad, try adding some orzo pasta! In a large bowl, whisk together the 6 ingredients in a large bowl. 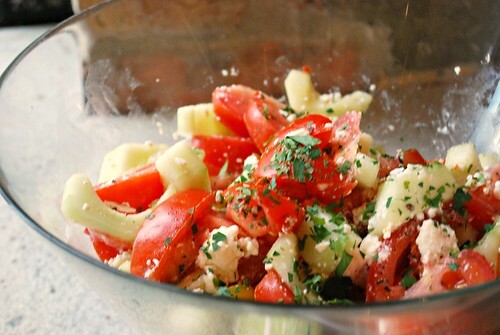 Add cucumber, tomatoes, and feta cheese; toss to combine. My husbands favourite salad! WIll be making this for him! Really all you need for a salad are tomatoes. Everything else is just garnishment!